Pinnacle's Voice Operator Panel (VOP) Soft Client allows your company's operators/receptionists/admins and other high volume and fast paced users to process calls faster and more efficient than any desktop phone set. Specifically designed for people answering and transferring calls, the VOP client runs as a program on the user's PC and can also allow integration with email and CRMs. Transferring a call is as easy as doing a "drag and drop". Ask about a 30 Day Free trial for current Hosted Phone Customers.... Also, softphone clients for standard office personnel or mobile sales people can be found on our Accession page. Each call has an icon showing its status and background color showing its processing priority. For each call on hold, the duration is shown and turns to red when a configurable value is reached. Callers are identified from directories and shown in bold when found in a local directory. Anonymous calls can be edited by the operator once callers have introduced themselves. The operator can quickly pick up incoming calls, put them on/off hold, initiate unattended transfers or call users and initiate attended transfers. Transfers can be initiated through a contextual menu, using configurable keyboard shortcuts or using intuitive drag and drop. When multiple companies, sites or departments lines are diverted to the application, the corresponding line number and name is shown in the "To" field of the call list. The operator knows before answering a call which company, site or department is called. Each directory can be linked to a line, when the operator picks up a call destined to this line the directory becomes the front directory on his screen. A greeting sentence can be added to the linked directory, this sentence will also be displayed in the "To" field of the call list to let the operator read it before picking up the call and pronounce it afterwards. Our application provides a CRM dedicated web browser window which can display any web based CRM. The URL to the CRM can be set up with parameters that are automatically filled with the incoming call information to directly show the caller record. In a directory each user has an icon next to his name showing the status of his phone. The operator can quickly decide when to transfer a call to a user. When the operator transfers a call to a busy phone the application automatically places the call on hold. When the phone becomes available the call is transferred without the operator intervention. The operator can also initiate a call pickup by right clicking on a ringing phone. With our Hosted IP PBX, the application also shows the status of parking orbits. You can also see the detail of the calls on a phone including the number of calls and for each call the caller/ee phone number and name. Particularly useful to see who is waiting in a parking extension. 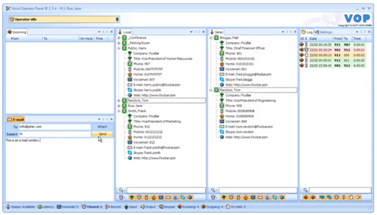 Multiple directories are available to the operator, to customize information in the way for the user to meet their individual need. The operator can also add new users on the fly directly from the incoming calls. Directories, like all other windows, are dockable and can be moved and placed anywhere on the screen using drag and drop, each operator can customize his workspace to ensure that the most important information are always visible. To ensure that the operator always finds a user, searches can be done on any information available in the directories such as name, first-name, company, office, department, title, phone, mobile, home, e-mail. To quickly find a user, start typing the name. As soon as the first key is pressed in the search field our application filters the results to display the matching users in the directory. The more you type, the more focused the results. To ensure that the operator can always contact a user to transfer a call or deliver a message, each user can have multiple contacts such as phone, mobile, home, voicemail, e-mail, or web. To quickly send an e-mail to a user, our application provides a built-in e-mailer which automatically fills the information from the call being processed by the operator. To browse users web links, for example to users schedules, our application also provides a built-in web browser. Each directory can be individually switched from Tree to Table layout for better visibility of users, phone status, and faster access to contacts. The software even allows customized pictures or icons to be added to created users and directories, if desired. Some overviews and instructional guides. Computer: PC, Processor Intel Pentium IV or better, 256MB RAM free or more, 50MB disk space free or more. USB Devices: Headset, Handset, Speakerphone, Light/Ringer. Some tested models are available here. Outlook Support: 2000, 2002, 2003, 2007, 2010, 2013, 2016. Contact us to setup a trial on your current Pinnacle Hosted Phone System.